What’s Bueno? Honey Maid Low Fat Cinnamon Grahams! SAY! I wandered into the ol’ 99¢ Only Store the other day and guess what I ran into! Guess! 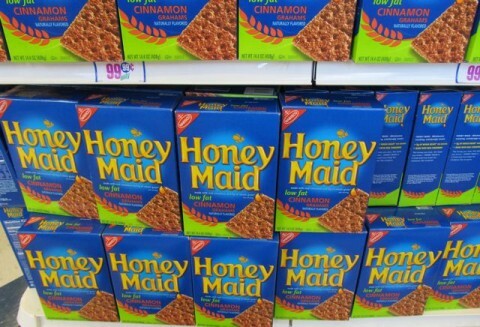 I ran into a great big display, an endcap, to use retail parlance, of Nabisco Honey Maid Grahams! Banged my ankle up pretty bad, too! I plan on suing the store! What are they doing putting an enormous endcap where I’m liable to run into it?! No, I’m joking. I’ll find something else to sue them about. Anyway, back to the grahams! You’re already pooh-poohing these things because they’re low fat. Yes, they’re “low fat,” but let’s face it, Tubby, you could stand to lose a few! And here I elbow you good-naturedly in the gut! First of all, your regular Honey Maid cinnamon grahams aren’t exactly oozing with fat to begin with! 5% is all! The low-fat ones? 3%! Christ, why even bother, right? But with so little fat (and no saturated fat in these babies!) 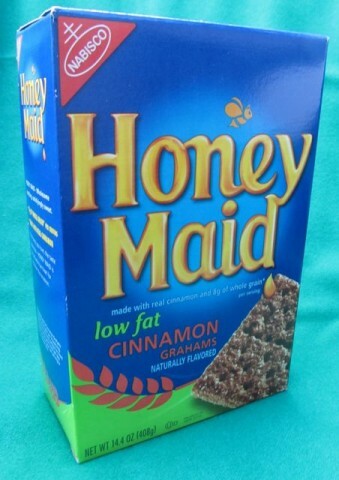 Honey Maid Low Fat Cinnamon Grahams are a food you can feel good about eating! Or, if you’re Alicia Silverstone, a food you can feel good about chewing, and your baby can feel good about eating! Posted by Ted on March 30, 2012, 3:11 AM.